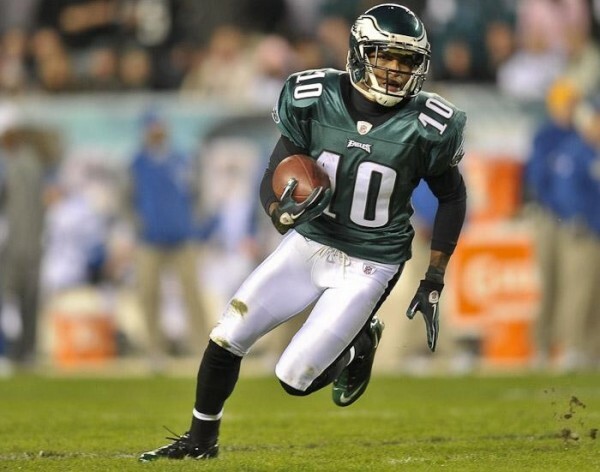 With a source claiming that the Philadelphia Eagles plan on using a franchise tag on wide receiver DeSean Jackson, the team has opened a series of doors that would have never been there if they decided to let him walk in free agency. Guaranteed, if the Eagles use the franchise tag as the source claimed, Jackson is locked into Philadelphia for this upcoming season. Jackson’s performance last season suffered amid a heavy-bout contract battle that he ended up losing. The former Pro-Bowler was nothing more than a shadow of himself on the field, and was totally and completely ineffective for the Eagles. This upcoming season, he will be making quadruple the amount of money he did this last year. Hopefully, now that he will be locked into $9 million plus, he will actually show effort and initiative on the field. When Jackson is making the impact plays he did two-years ago, he becomes one of the best deep threat receivers in the game. Michael Vick and Jackson have an excellent chemistry, and can rip defenses when they’re rolling. If Jackson shows up to win games next season, the Eagles offense is one of the fastest and deadliest in the NFL. I’d say that at this point, this is nearly impossible. The money that Jackson wants is way more than the Eagles are interested in paying, and thus far, he seems rather unbending on his demands. Not to mention, Philadelphia must still be sour about how Jackson totally slacked off last season, and they might have no desire to re-sign a diva receiver long-term. However, Jackson loves the team, city, and the fans, and even issued an apology to the organization, saying that he could have handled the situation with more maturity. The Eagles could look back at the film from 2010, see his amazing game-changing performance, and reach a median on a long-term deal. Again, I wouldn’t count on it. Ding-ding. This is the most likely option of the three, and the Eagles have probably planned this from the get-go. Philadelphia can apply the franchise tag to Jackson, and then deal him to any team they see fit. Meaning, that instead of letting their ex-star wide receiver walk and get nothing in return, they would be able to score something with a trade. The best part – the Eagles wouldn’t even have to pay Jackson his $9 million, the other team would. The only issue, Jackson’s value has plummeted after last season’s antics. In 2010, his value would have been through the roof, now, it’s quite low. Judging how much other teams would pay is hard to gauge, but I would assume that in terms of draft picks, the best the Eagles could get is a second-rounder, and that’s being generous. Again, something is better than nothing in this situation. Regardless of what the Eagles and Jackson end up doing, the decision to franchise him is a good one. It would be useless to let him leave in free agency, and the Eagles could either use him in a trade or for one more season at receiver. What will happen, though? I’d say it’s close to a guarantee that Jackson will be traded, and more than likely, it will be for a draft pick in April.